The Student Portal is where students can take online assessments, view their test results, complete assignments, and access personal resources. This document will review how to take an Item Bank Assessment in the Student Portal, including the use of tools that may be available. Or, click on the TAKE ASSESSMENTS Flip Card (1c), then click on the assessment name as instructed by your Test Administrator (1d). If a PIN is not required, you may begin taking the test as soon as you click on the assessment name. As a security measure, some assessments may require you to enter a 4-Digit PIN before you can take the assessment. The same PIN will be provided to all test-takers by the Test Administrator. The PIN will expire approximately 30 minutes after it is first used by a test-taker. Once you access the assessment as shown in Step 1, if a PIN is required, a window will appear. Enter the PIN your test administrator has given you in the box. 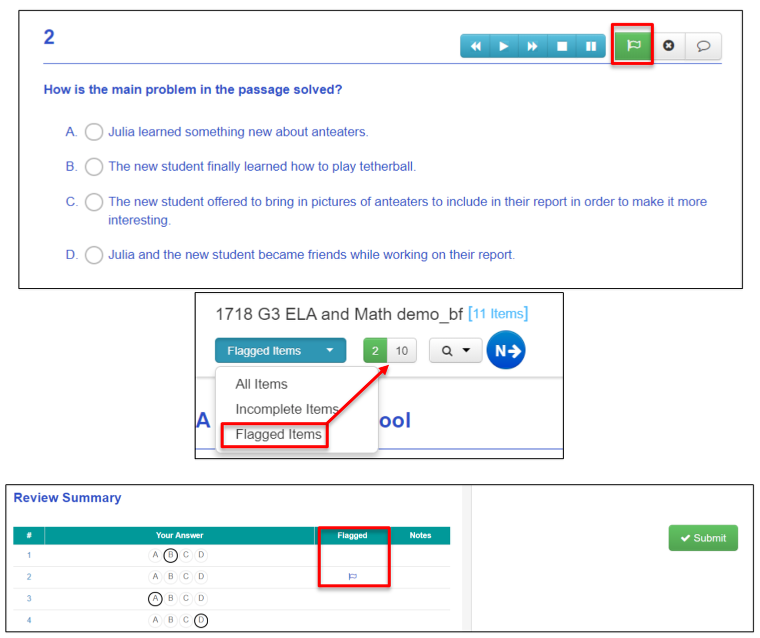 The Assessment Name and Number of Items (test questions) will appear at the top left. View All Items or Incomplete Items (those items you have not yet answered). Click on the arrow in the top right of the passage to expand to full screen. Go to any item (or group of items) by clicking on the number(s) of the item(s) you want to view. The item number(s) you are currently viewing will be green. 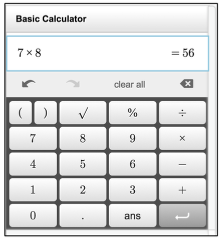 Use the drop down menu to view and select the item you want, or enter a number in the box, and press the Enter key on your computer or tablet. Click the Next icon or Previous icon to view the next item or previous item. Click on Save periodically to save your work. Your work will be automatically saved when you move to the next page. 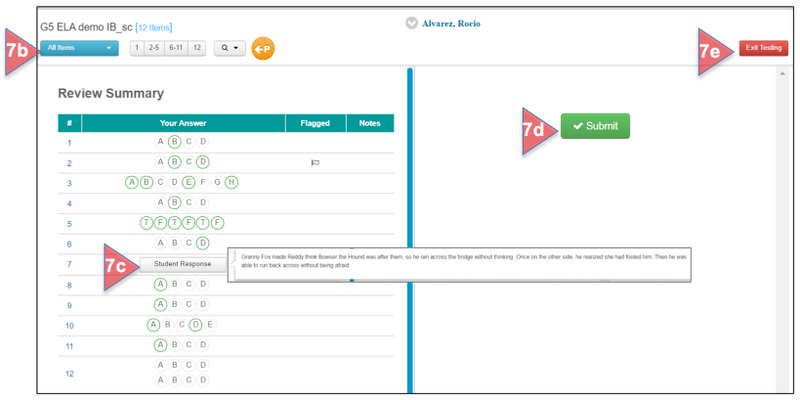 Click on Exit Testing only if you are as instructed by your Test Administrator to do so. The tool icons are shown in the upper right hand corner of your screen. Available tools are determined by the Test Administrator and/or Test Creator. Dictionary: Highlight a word in the text of the assessment. 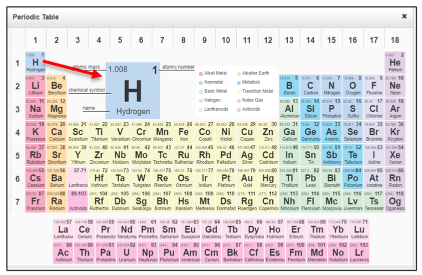 The definition of the selected word displays in a small floating window. Click the speaker button on the right side of a definition to read it aloud. Click on the red x to close the window. 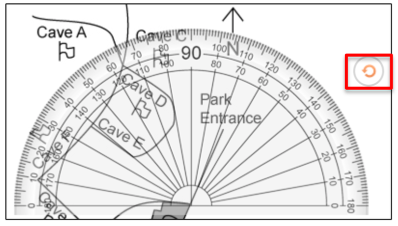 Picture Dictionary: Highlight a word in the text of the assessment. A visual definition of the selected word will display in a small floating window. Click on the red x to close the window. Translate: Highlight a word (not a phrase) in the text of the assessment to translate the selected word from English to Spanish. The translation will display in a small floating window. Click the speaker button on the right side of a translation to read it aloud in Spanish. Click on the red x to close the window. Text to Speech Audio Settings: See Step 6 below for more details on using Text to Speech. Click the speaker button to open the Audio Settings window. 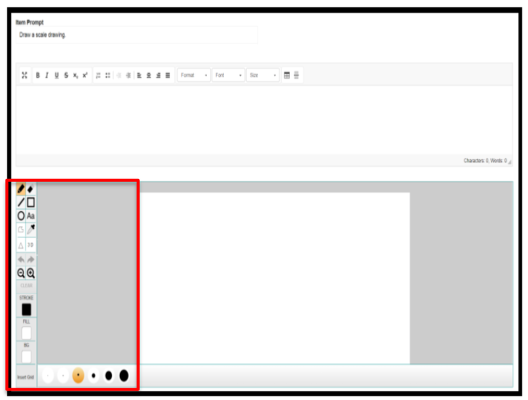 Specialty tools that may be enabled include Text to Speech, Equation Editor, Special Characters, Pop-Ups, Rollovers, and a Drawing Tool. Text to Speech: Text to Speech may be enabled for the passage only, the questions and answers only, or the whole assessment. Use the buttons as described to have the text read aloud. See “Text to Speech Settings” in Step 4, above, for how to control the volume, speed and the pronunciation language. The Equation Editor is part of the CKEditor text box formatting tools. 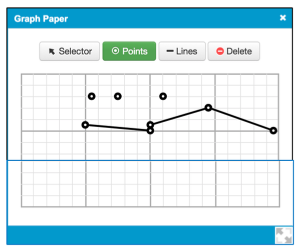 There are four levels of editors: Elementary (shown below), Algebra, Algebra with Trigonometry, and Advanced. 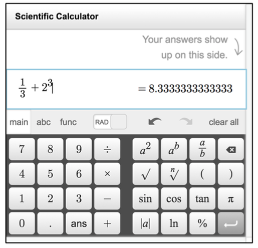 Write the equation in the space provided and click OK to enter it into the text box for scoring. 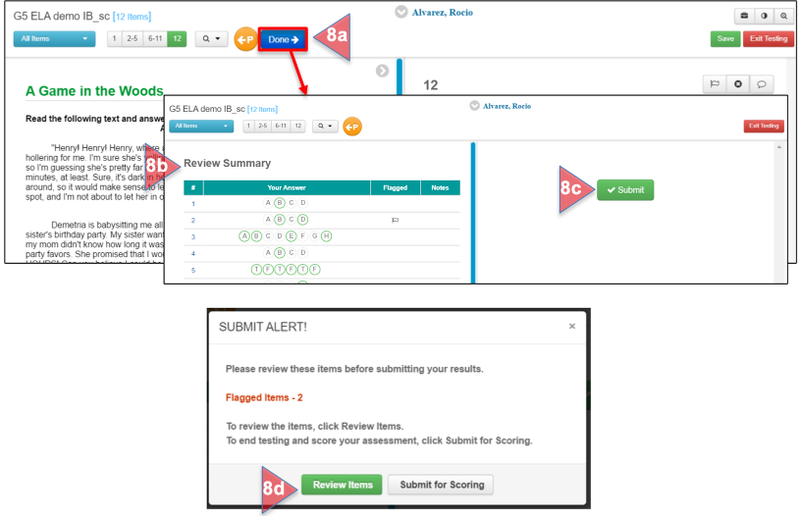 Click on Review Summary at any point during the assessment to review your answers so far, see flags, and notes. Click on All Items and select Incomplete Items and/or Flagged Items, if any, to return to those items. 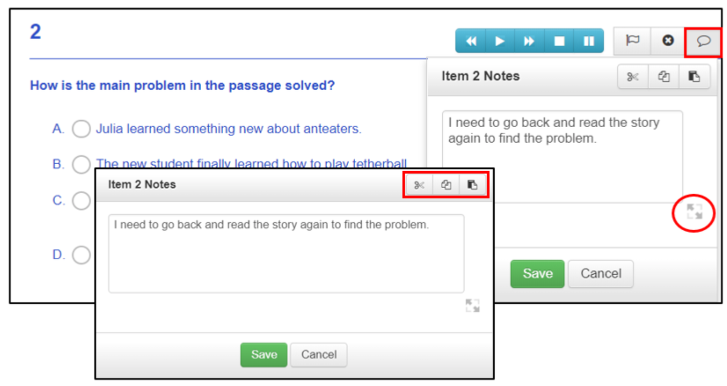 Hover over the Student Response item to view your answer(s). Exit Testing: If for any reason, you must stop taking the test, or if you are directed by your Test Administrator to do so, select Exit Testing. Your work will be saved and you may be able to log in again to continue taking the assessment, given the time window is still open and you have permission from the Test Administrator. You may need to be given another PIN if one is required. On the last page of test items, when you’ve completed all items, click Done. The Review Summary will appear again for a final opportunity to check all answers. Click Submit when your test is ready for scoring. A Submit Alert will appear, confirming this action. If any items are flagged or incomplete, these will be included in the alert. Click Review Items to go back and make corrections, remove flags, etc. Or, click Submit for Scoring. Depending on Test Security measures, you may be able to view the test results immediately. Your total Percent Correct will show underneath the assessment name. If a constructed response item still needs to be scored by your Test Administrator, a message will appear with that information. 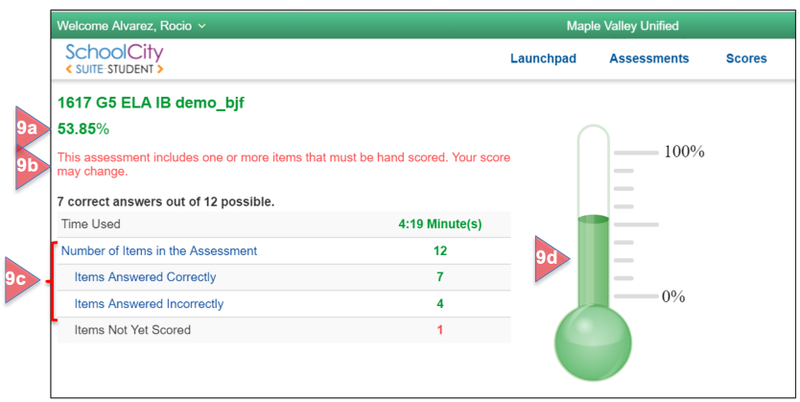 Click on any of the item correct or incorrect statements in blue to go to the Review Scores screen for this assessment. A thermometer may appear as a visual representation of your score.